something about ST5/TT5 - Page 6 - Miata Turbo Forum - Boost cars, acquire cats. those are big. $$$ i'll bring some brake pads that car work with those to savanna. My plan is to get hawk bucks and use it for DTC-50 front and whatever compound I could get in the rear. You should try the PFCs. So noice! I want to someday for sure, but hawk bucks are free if I finish/place well! Also, surely it's been posted several times, but it's still entertaining to me. Last edited by flier129; 01-18-2016 at 04:08 PM. 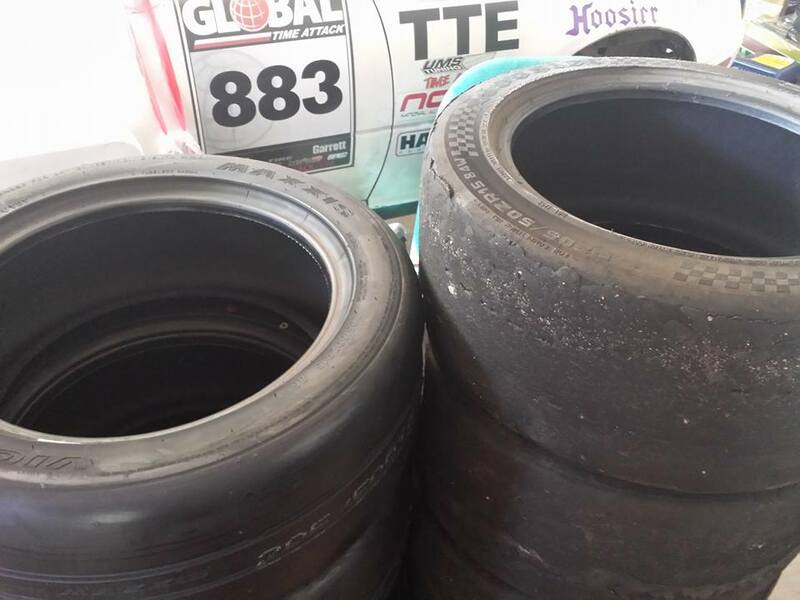 I had some 205 RC1's and 205 R7's stacked next to each other. Took a picture for lols. Of course the coldest weekend for Savannah, GA was this weekend Saturday morning it's 33/34 degrees with a light drizzle of rain. My first sessions is around 8:55am. I keep the RS3s on, because I don't want to take the sticker R7s out in the wet/cold lol. EXTREMELY slick..... I'm coming down the front straight at about 90mph and notice the rain drops are bigger...... wait no that's snow.... it was literally snowing while I was on track lol. Second and 3rd session was a bit better, still wet and slick as hell. Fourth session it's finally like 38* and the track is completely dry, I see several people finally putting on decent tires. So, I mount the R7s on the car. 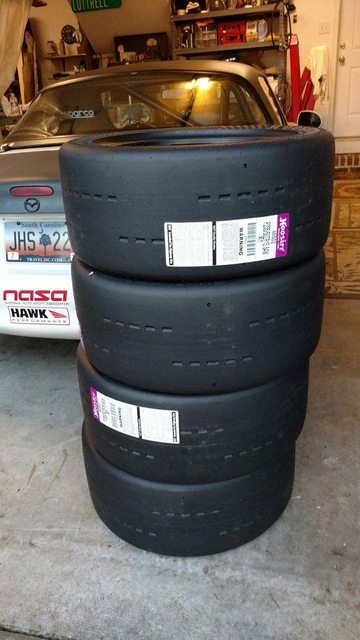 TONS of grip and a big adjustment from what I was use to earlier(cold/wet track with RS3s). Last session of the day and it's a full field. I was well off pace last session, but knew I had several seconds where I could make up time. Right after green I notice the current leader in TTE spin off track coming into T1 he's at a 1.24.9. So I'm thinking ok here's my chance to get into the lead! Get to lap 3 and notice a silver E36 behind me as I come into T1, put a little distance on him until T9 and then he was on me. Strolls past me(while I was WOT) at the start/finish and I notice TTE on his car. "HOW THE **** IS THAT IN TTE!" I'm thinking, it was truly comical how easy he passed me on the front stretch. Come into T1/T2 and I shorten the gap and then completely close the gap in T3 "ahhhh, that's why he's in TTE". 93 E36 325i 4-door, 3080lbs ~180rwhp, 245 R7s, damn bullet car in E! So end of the session, I turn a 1.24.3, but the E36 turns a 1.24.0... damn. Then out of no where Parkhurst(the TT director) puts down a 1.23.5 in his E30! 1st moves to 4th, I end up 3rd, e36 in 2nd, the guy that I thought would win is in 5th, and Parkhurst wins. Kind of cool to have close racing like that locally. Many mistakes for all my laps, but I'm learning to go faster. There's a solid 2 seconds in the car for sure, just need to get myself there . I need to fix my steering rack(SEND ME YOUR **** BEN! ), it's currently not depowered completely and is wayyy too stiff. You can see I'm using a lot of my upper body on the wheel. I also need to work on relaxing my lower body, I tense up way too much especially with my left leg on the dead pedal. 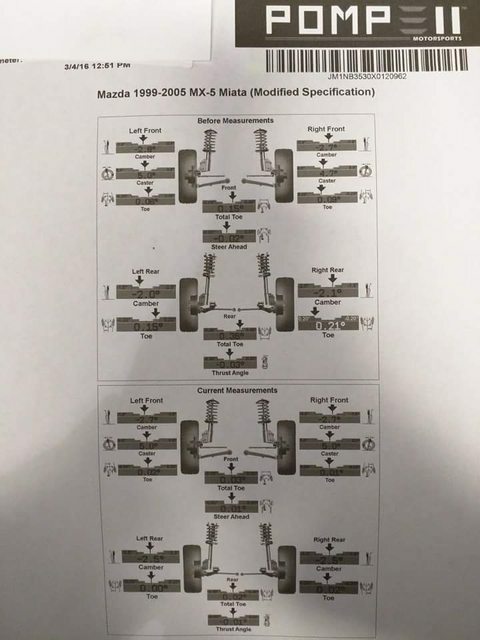 Good job man, I am going to try to do both of our steering racks when I get back to Ben's house again. Hopefully in the next few weeks. I need to sack up and do the AC and PS delete on Swagg. Did you heat cycle these r7s for over 24 hours? I didn't but I plan to on my next set. I've already got half of it! 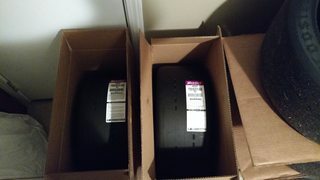 I plan on winning the other half and maybe more at Road Atlanta. I've got a fast/high hp Sentra and the e36 to beat along with the rest of 6-7 TTE field, though. I did a rough corner balance the other week, managed a 49.9% cross weight on the car wet(myself and 1/4 tank). The scales I was using actually had me about 15lbs under my min weight, so I'll need to make sure to run more fuel than a 1/4 tank. Then I went to a local motorsports shop, Pompei, to get it aligned. And after my ride height adjustments I've lost some front camber. which I was trying to avoid, but it's obvious I need some offset bushings. I use to get -2.9 up front consistently, only managed -2.7. I decided to go with 0 toe all around. 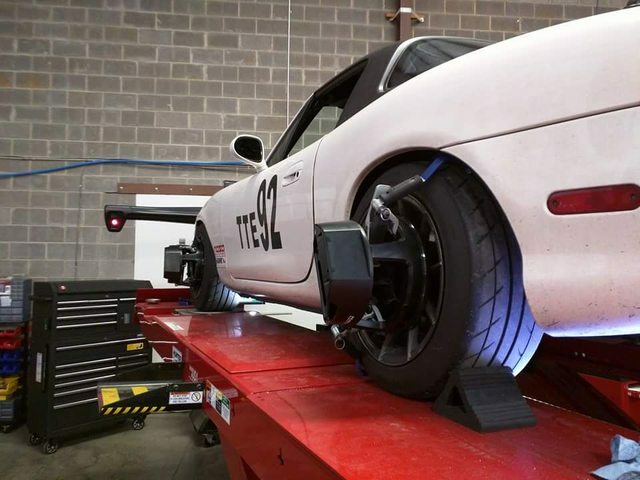 I never have any on-throttle over-steer issues, so I ditched the rear toe I normally run. Wish I could of installed some 800/500 springs on the car before this weekend, but it just wasn't going to happen. I over-reached with trying to get the OSG into the Z and the miata prepped, turns out neither will have all the parts I was aiming for on the next two events. Oh well, lesson learned. Road Atlanta event this weekend, 6-7 in TTE! Rain looks like a strong possibility, but hopefully we can get a few dry sessions. Next weekend I'll be running the Z at Dixie, no expectations there since I'm on RS3s instead of hoosierstones Both events should be a good time. i'll see you at Road atl. do you have data? i have a aim demo seat i can loan out. Back from Road Atlanta. I didn't go fast enough and got beat by a Sentra and Espinosa(se30 champ) driving a TTE trim E30. I need more power!!! but really, I just need to grow a set... brake later and get on the throttle sooner. Is my clutch slipping? Seemed like my clutch was slipping while shifting 3rd to 4th..... 4th or 5th seemed fine though. It's a 1.6 OEM replacement.... I need an upgrade. I need to consistently brake later for T10, I think I'm losing a lot of time there. Am I over slowing for T7(before the back straight)? I haven't looked at all my data, but I did T2/3 in 4th on Sunday and it felt a lot faster... spent less time getting the car into 3rd and was able to concentrate completely on braking/line/back on throttle. To me it looks like you're already braking pretty late for T10, but I can't tell from the video if your over slowing or not. I would think turn 6 would be a 4th gear corner, you may be over slowing there and not carrying speed by down shifting to 3rd. Similar story on Turn 5, I would think it's a 4th gear corner in your car. I would have left it on fourth and made sure to nail the turn-in, apex and use ALL of the runoff. Also you should be back on the throttle there basically immediately after you turn in. On your fast lap it seems you could have gotten on the power sooner in T7. You should be flat on the power full throttle from 10b all the way to T1. Were you flat through the last corner or feathering it a bit? 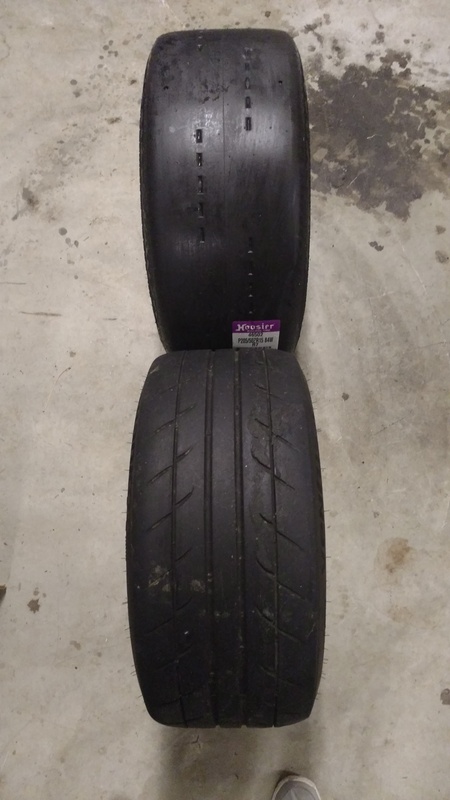 It looks like you used the curb pretty well in T3 but most of the really fast guys at Rd Atl in Miatas say you can't use enough of the curb there? 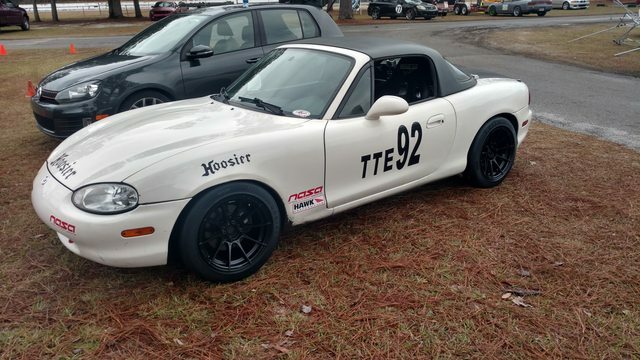 I've never driven a Miata at Road Atlanta, so take my input however you like. I may be full of poop regarding using 4th gear in T5 and T6. Your clutch is for sure slipping. That's exactly what started happening to my stock 1.8l clutch with like 105k miles on it. Ended up replacing it immediately. I think the best combo that is still a "normal" clutch and not an expensive twin disk setup is the Fidanza 1.6l flywheel and the Exedy Stage 2 with Thick Disk. First off, I don't want to see another video from you with full driver safety gear and HNRS. Suit/socks/gloves/current helmet. Visor down or eye protection. You need to become more comfortable with threshold/trail braking. A few entries you go in a wee bit too slow then make a too abrupt initial turn in input that upsets the car. Look at your data traces, you'll see the decel to turn trace to be concave when it should be ever so slightly convex. That last bit of entry not only gains you time but makes it easier to bring all 4 tires up to optimum slip angle without slipping over. I would experiment setting the car up to favor turning right for RA. Several ways to do that but 1% wedge, raise left side and add camber there would be a place to start. Just that would probably be worth .5s, maybe more. 1mph off 10B would probably gain you .5s all by itself. T1 I would go in 5th or at least downshift later. The track flattens from turn in to apex so you will lose a bit of grip there. Let it. The track rapidly gains elevation at the apex so it will stick like crazy and bog down. You have to hit the first part fast enough and sliding so you still have enough momentum to keep the tires sliding up the hill. You were, like I imagine many drivers do, keeping it hooked up and not sliding much on that level spot after turn in. That dooms you to bog after the apex in a low power car. You didn't even use all the exit. In a high power car, you don't track out. In a Miata, you should be using that exit kerb. Chuck it in there (after you get drivers safety gear). T2 You didn't adequately brace yourself or hold the wheel firmly enough under braking so you have a big yaw moment there that scrubs speed and pits you a foot or two offline. Be cognizant of your steering input/corrections when shifting. They should be just as smooth as two handed and that takes strength, bracing and good seating position. When you do turn in, it's an abrupt jerk that upsets the car/scrubs speed at the apex. Exiting T2 you were not at the limit of traction, therefore you could have taken it faster. T6-7 Work on braking harder and transitioning off the brakes smoother. You're not braking quite hard enough then too abruptly releasing brakes and too abruptly turning in. T6 you could have been a wee bit faster. T7 you miss the apex a bit. Did I mention driver safety gear? Wow, faster feedback than I thought! Really appreciate it. Emilio - Hans is my next purchase, I actually plan on getting one before the next event at Roebling. Need to give Johnny C a buzz on that a few other things. Ideally, I'll have all the equipment for myself and car to do w2w by next year. Hans > new visor > suit > new gloves/ & shoes > cage is my current plan. Your reminder of safety equipment is always welcome. Aaron - I do have the 1.6 fidanza, so I just need to upgrade the disc to something like the exedy you mentioned. Efini(I use to know your name!) - I'm surprised you haven't driven a miata at RA. Come drive mine and beat Espinosa? Everytime I went into T10 I felt like I could of broke later. On my fastest lap I was WOT from 10a entry til T1 entry. T1 - I wish I had my 45.6 on video, I believe my 0.5s difference was mostly for how much faster I took T1 on that lap. I was sliding a tid bit on the flat portion and then another small slip after apex/bump. T2/T3 - I was experimenting on Sunday by staying in 4th gear for T2/T3, but only had two lap sessions that afternoon. So I never got a chance to see the speed differences during the same session. 4th gear felt more comfortable for sure, car felt more settled, so I should of mounted the curb some more like Efini mentioned. T5 - I don't know why, but I'm scared of this turn the most. I never tried it in 4th, but I believe it can be done with my current setup. Enter smoothly, get back to WoT at turn in like mentioned, and exit on the curbs. I'm paranoid about understeering off into the dirt mainly. T6 - Wanted to try 4th gear on this as well, didn't get the chance. After watching my videos and watching Kohler's/Powell's I can take it in 4th no problem. T10a/b - I would mule kick the brakes right as I thought I was passing the 200 sign, so ~150ft. Tried to trail off smoothly, as Emilio mentioned, but wasn't consistent with it. The times I did trail off decent and grabbed a lot of 10a curb I would get thru 10b WoT without issue. Thanks for the feedback fellas, I honestly appreciate it. You can't just get a disk. Get the entire stage 2 clutch kit and a new insert for the flywheel. On my old original clutch when it was slipping, the disk was actually fine and within spec, the pressure plate was just old and had lost some of its clamping force. Pressure plate clamping force is a huge factor when it comes to how much torque a clutch kit will hold. Also, this is what I have for a head and neck restraint and I really like it. I've tried a HANS brand device and this blows it out of the water in terms of getting in and out of the car and comfort while strapped in. I have a coupon code for Winding Road that will take 10% off your order, just shoot me a PM and you can have it if you're interested. You need to get on their contingency program, it's awesome. You can use the coupons to get hundreds off in order to get you into full safety gear as soon as possible.